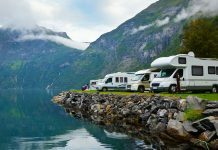 Going on a camping trip together with the family might be the highlight of a summer vacation, but to make sure that the entire family will have a good time, you should be looking for those camping tents that got good reviews from the other users. 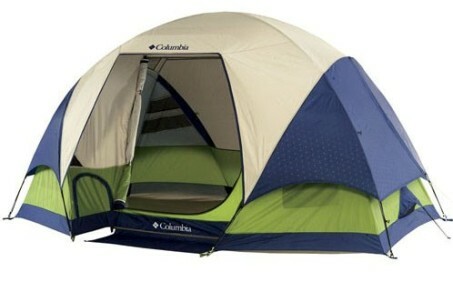 This is one of the best tents in case you have 3 people going camping. 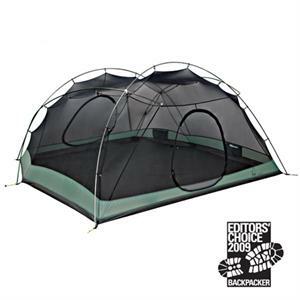 This one comes with everything that you need and everything that the expensive tents have, but you can find it for about $250, making it a great value for money. 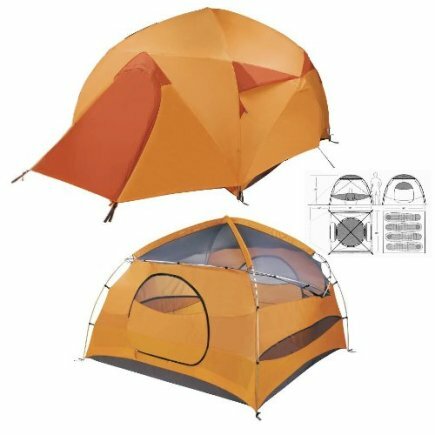 This tent can be used in 3 seasons, and it also has gear loft and footprint that need to be bought separately in the majority of the cases. The poles are made of aluminum and so you can be sure that they are reliable and they will maintain their strength. 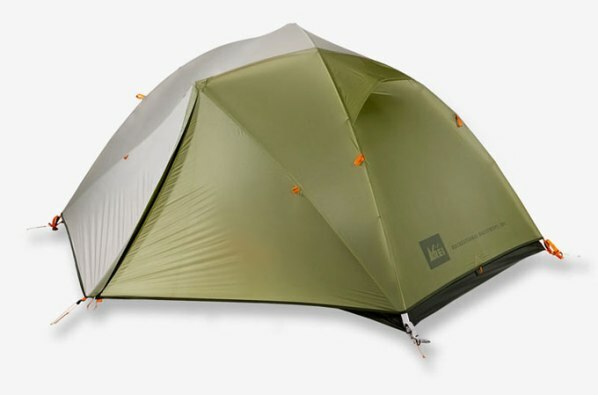 Although the brand is not one of the top brands, this tent still is one of the best. 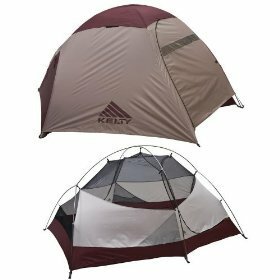 It has been created for 3 seasons and it is a freestanding lightweight backpacking tent that comes with special poles and a color coded hub pole set and also clips that make sure that you will have no trouble setting it up and taking it down. 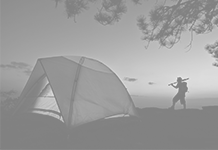 The price of the tent is of about $300 and you can find it at REI stores, online or offline. 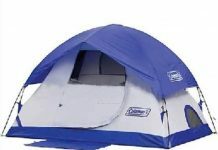 This is considered to be one of the best camping tents because of its livability, sturdiness and ventilation. It comes with advanced pole structure, offering it great stability and the walls are almost vertical offering you more inner space. 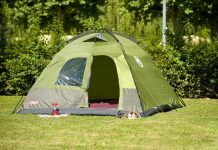 It is just great for stormy weather because you have to pitch the fly, footprint and poles first and then you attach the inner tent. 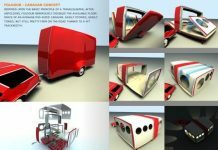 Inside you will have 50 square feet and the interior height is of 48 inches. What else could you be looking for regarding a tent? 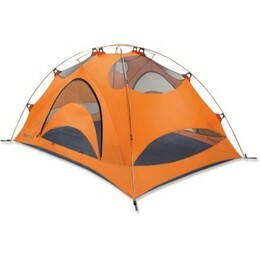 This is one of those camping tents that are quite light but still offer enough space for 3 people. There are 2 doors with individual vestibules for storing the camping gear. 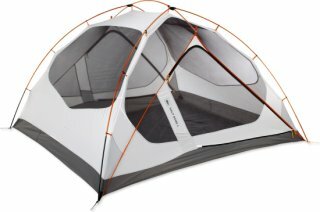 The biggest downside of the tent is its price tag, of $500, but you could also find it $50 cheaper. 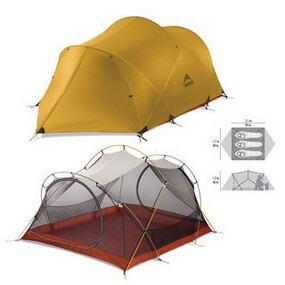 The poles used with the tent are strong and the best thing is that they are easy to assemble. The minimum weight is of 4 lbs. 3 oz., but this might increase up to 4 lbs. 12 oz. 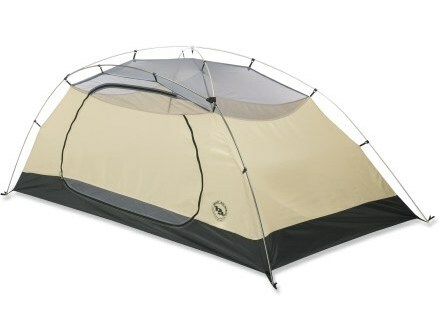 In case you are looking for a tent that has plenty of space, this is the tent you have been looking for. 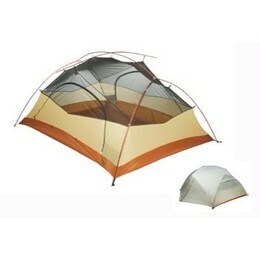 In case you want more space, you have to opt for the 4 person tents, but they wouldn’t be as light as this one. 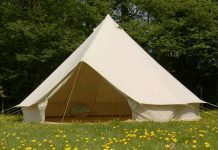 The maximum height of the tent is of 44 inches. You can be sure that you will fit inside this tent in case you are going with your spouse and with one child. For a short while this will become your home away from home.
. The average weigh of the tent is of 7 lbs. 10 oz. and you could split the weight between the backpack of 3-4 people. 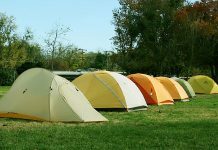 This type of camping tents has all the features that you would find at a more expensive tent. 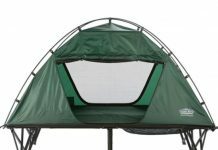 This tent it known for having a great pole structure so that it offers enough head room that you need in case of a family camping. Just as in the previous cases there are two vestibules for storage space and so the inner space is maximized. The ceiling is made of mesh and there are also wall panels and low level side vents that offer air circulation. The only downside of the tent is that it is heavier than the majority of the 4 person tents but it offers more durability and protection against wind and rain. 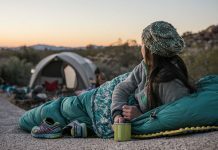 This one fits in the category of tents made of lightweight mesh and nylon and offers a large interior space that is just enough for a small family. The price of the product varies from one store to the other, but the general price range is of $350-$450. The best thing about it is that it is very easy to set up due to the Jake’s Foot corners that lock the pole in the grommet and there are fewer problems that could occur while setting it up. 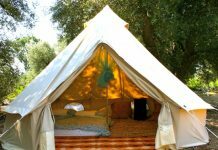 The tent is considered to be one of the best because it is lasting and it offers enough space for 4 people to sleep comfortably in it. The front vestibule is larger and it offers enough storing space, while the rear vestibule is smaller and more compact, perfect for the smaller items. The frame comes with color coding, so it is really easy to set up and the assembly has to be made by clipping, so it is a really easy job. 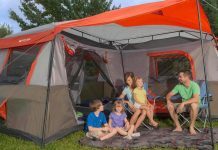 If you have a larger family, you might need a 5 person tent. This product is great value. It has a dome style and you could find it for about $170. It comes with a cyclone venting system to increase the air circulation in the tent, rain protections system so that the rain won’t get inside, storage lockers and color coded poles. This tent is one of those camping tents that for sure should be considered before you make your decision.